1) For most fruits and vegetables, there is little, if any, nutritional advantage of fresh over frozen. Frozen fruits and veggies have been picked at the peak of their ripeness and instantly frozen at high temperatures, preserving their nutrition and most of their taste. 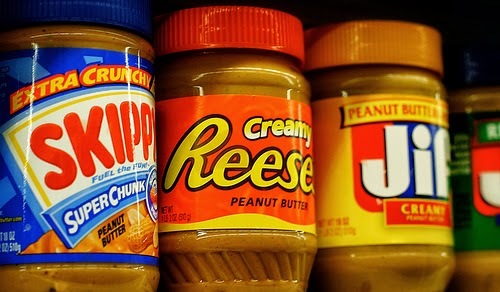 2) Gourmet peanut butter brands costs twice as much as standard supermarket brands, but you’re getting the same amount of protein. Some gourmet brands even contain more calories than the standard brands. Check both types for added sweeteners and salt. 3) Extra-virgin olive oil costs up to 5 times more than generic virgin olive oil, but has no nutritional advantage. The extra-virgin does not undergo as much processing, but only those with refined olive oil palates will notice a slightly better taste. 4) Canned foods retain a surprisingly high amount of their nutritional value. Countless research has found they cost much less, save time, and are just as nutritious as the fresh versions. Just avoid ones high in salt, MSG, and sugar like prepared meats and Vienna sausages. 5) Protein content is not affected when it comes to canned chicken, tuna, and salmon. Canned salmon is exceptional in that it is the nutritive equivalent of fresh. 6) It’s a waste of money to spend more on organic pineapples or bananas, since the fruit is inside the skin and they are not known to be contaminated fruits. However, either spend the extra money and buy organic, or thoroughly wash the following “Dirty Dozen” fruits and vegetables: celery, spinach, blueberries, strawberries, nectarines, apples, potatoes, sweet bell peppers, grapes, lettuce, peaches, cucumbers. 7) Americans spent over $1 billion in fish oil supplements in 2010. Researchers analyzed the findings of 14 double-blind, randomized, placebo-controlled tests that totalled more than 20,000 patients with cardiovascular disease. The results were that regularly taking omega-3 fish oil supplements did not reduce the risk of heart failure, heart attack, or stroke. For a heart-healthy lifestyle, doctors recommend a healthy weight, cutting back on sugar, physical activity, plenty of fruits and vegetables, and at least two 3.5 ounce weekly servings of fish, preferably oily. 9) People who eat at least 3 servings of vegetables daily have a lower risk of heart disease compared to people who eat less than 1.7 servings. Twelve studies tracking 278,000 people over 11 years found the arteries of veggie eaters were far more flexible. 10) Top 5 veggies that deliver maximum Vitamin C: red bell, green bell, and green chili peppers, Brussels sprouts, and broccoli. Top 5 veggies that deliver maximum fibre: artichoke, peas, avocado, lima beans, jicama. Top 5 veggies that deliver maximum potassium: sweet potato, lima beans, spinach, Swiss chard, Portobello mushrooms.